Southern Illinois University Edwardsville’s Police Department has added seven officers to its squad of 27. All of the new officers have direct ties to either SIUE or the Metro East. 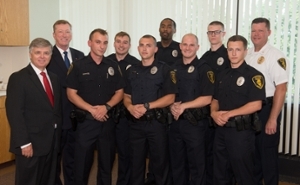 The officers were sworn in last week by SIUE Chancellor Randy Pembrook, PhD, as Vice Chancellor for Administration Rich Walker and Chief of Police Kevin Schmoll also participated in the ceremony. “It’s an honor to work with a group of people whose oath is to serve and protect,” Walker said. “I want to congratulate and encourage each officer in their continuing commitment to law enforcement. I hope they are able to take much pride, satisfaction and fulfillment in their profession. Dalton Archer is an Edwardsville native and earned an associate’s degree in business from Lewis and Clark Community College in 2016. Larry Bowles is a U.S. Army veteran, who served from 2013-17. He earned an associate’s degree in applied sciences from Lewis and Clark Community College in 2011. The Godfrey native now lives in East Alton. Tyler Gallaher earned a criminal justice degree from SIUE in 2016. Originally from Belleville, he makes his home in Glen Carbon. Anthony Hettinger earned a criminal justice and business administration/marketing degree in May 2017 from SIUE. During his time as an SIUE student, the Lovington native served in Dining Services for two years. He is a Glen Carbon resident. A former Cougar men’s soccer player from 2011-15, Fairview Heights native Travis Hoguet is completing a degree in criminal justice from SIUE. He arrives on the SIUE campus after serving as a police officer in Gulf Shores, Ala., and now resides in Collinsville. Dylan Koke graduated from SIUE with a bachelor’s in criminal justice in 2014. The Collinsville resident serves in the Army National Guard. A Chicago native, Kelly Waters currently resides in Collinsville and is finishing a degree in criminal justice at SIUE. Photo (L-R): SIUE Chancellor Randy Pembrook, Vice Chancellor for Administration Rich Walker, Dylan Koke, Larry Bowles, Travis Hoguet, Kelly Waters, Tyler Gallaher, Dalton Archer, Anthony Hettinger and SIUE Police Chief Kevin Schmoll.